In the fridge, above the yogurts and beside the butter, there is a bag of wood. Keeping this sort of thing in our fridge is not completely unusual in our house. The bags contain scion wood of 18 different varieties of apple, cherry, apricot, plum and pear trees that I will use for grafting at the end of this month. Each variety is stored with a wet bit of newspaper around it's base and then wrapped in cling film with a label stating what tree it is. I check these every few weeks to make sure they haven't dried out and they are kept so they won't ever freeze. I found quite a bit of conflicting information about storing scion wood on a small scale so I hope this is the best way. Anyone else storing scion wood at the moment? No room in our fridge because of the jars of milk from our cow! But what a wonderful project, and I shall look forward to seeing you do with those scions next. Don't worry I'll be boring you all soon with this years grafting! What are you going to do with all that milk? 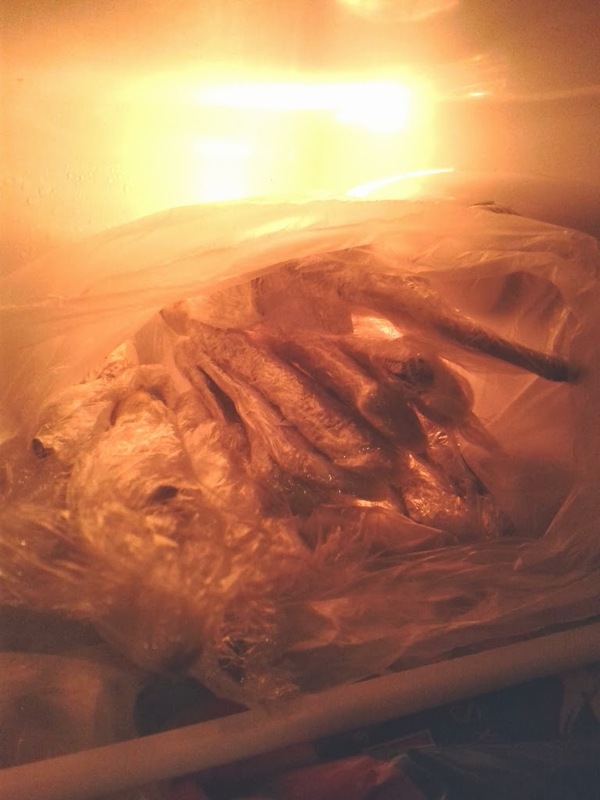 How interesting, I find the odd package of worms for fishing sneakily stored in the fridge. Be careful there Kev. It starts with a few twigs and it soon gets out of hand. I heard that you English were funny that way. ;-) Not long ago I saw a TV documentary on a fellow over there that kept roadkill in his fridge. The whole dang thing, no gutting, cleaning and quartering, just chucked dead flattened badgers and hedgehogs in his fridge. Didn't do much to them either before cooking them and consuming them. I have never heard of this. Very interested in how this works. I did a course but it wasn't much cop so I brought some books, went to a large tree nursery and learnt like that. it seemed to work last year on the 30 or so trees I did and this year I'm going to do a hundred or so. Good for you Kev! We hope to get to the tree grafting stage some day. Save some for us will ya? I'm sure they'll be plenty left. Don't it off though its a great skill to have. Particularly useful this year when it's been so warm. I managed to germinate some holly (having not been successful before) after keeping the seeds in the freezer for a while.